Today’s customers are expecting more than ever from their favourite brands. With a proliferation of tech-savvy companies tuned into the digital economy, customers can have on-demand access to food, transport, and endless personalised services at the touch of a button. Why shouldn’t this be the case for their bank services too? A recent survey conducted in the UK highlighted that incumbent banks still have a long way to go before they meet their customers’ expectations. Further research shows that mobile and online banking are now gathering significant pace, with more than a third (38 percent) of consumers carrying out their banking via a mobile app on a regular basis, rising to 53 percent for the 18 to 34-year-old bracket. Mobile banking 1.0 brought simple banking transactions to our fingertips. But banks can’t rest on their laurels – the death of the simple mobile banking app is not far away. Customers are now expecting a much more joined-up, customer-centric approach. Step-in mobile banking 2.0 – the future personal finance management tool giving a single view of a customer’s finances, including bank account, student loan, credit card balance, mortgage applications, and more. Changes to competition in the banking industry come into play this month, such as the move to open banking and the second Payment Services Directive (PSD2). These are set to drastically shake up how a bank interacts with its customers. So how can banks maintain mobile leadership and what should bank CMOs be doing to provide customers with more streamlined services? It can be easy for banks to lose track of what is most important to customers, and organise their business to focus on functions and product lines. This product-led mantra leads to a siloed approach to business growth, and neglects customer satisfaction. When customers ‘feel’ a purely transactional relationship with their bank, it can be difficult for them to build a significant amount of trust. This means important customer relationships risk being resigned to the short-term. It is the bank CMO’s responsibility to champion their customers’ needs, bringing these to the board and shaping business strategy to fulfil expectations. In this respect, the role of the CMO is gradually changing into that of a ‘Chief Customer Officer’ (CCO) with scope to foster a more customer-led culture, and an ethos around creating customers for life. In the future, customers setting up a current account and accessing mobile banking applications may see integrated AI chatbots guide them through the process – with the chatbot asking them a few questions and requesting verification, such as a passport or identity card. With this type of automation, account set-up time can be reduced to a matter of minutes. Customers can also have immediate access to their account, tailored to their preferences, with the bank fulfilling vital KYC (know your customer) and AML (anti money-laundering) requirements. With the use of AI, banks can become more attuned to their customers’ needs and offer highly efficient processes. Optimisation of onboarding processes such as these, that previously would have taken multiple days, will also give vital time back to staff to deal with more strategic activities. Artificial intelligence and machine learning technologies are not only enhancing processes such as customer onboarding, but are also helping to improve different aspects of customer interaction to improve the overall Customer Experience. Banks today can receive hundreds of FAQs and enquiries through their call centres every day. By using AI-enabled chatbots to automate responses, customers could receive answers to their queries in a matter of minutes – and again, bank staff can be freed up to deal with more pressing issues. But banks mustn’t lose the human touch altogether. By giving the opportunity to connect with an agent via video link, customers can be assured there is always the option to speak to a human if required or preferred. Customers, along with data about their transactions, are the most valuable assets a bank possesses. With AI now helping to bring new-found data insights and analytics capabilities, bank CMOs can harness the power of this data – using it to serve up personalised services and recommendations to customers. The simple mobile app alone is giving banks a window into customers’ accounts and needs. Customers using a mobile banking app will give their bank access to data such as their location, transaction history, salary, mortgage rates, holiday budgets, spending habits, and more. With PSD2 coming into effect this month, this proliferation of data will only continue, as consumers begin to grant trusted third parties access to their banking data through open application program interfaces (APIs). Bank CMOs should be capitalising on this opportunity and connecting the dots between their customers’ transactional data, personal data, and social media data. Powerful AI algorithms can then identify when these customers will be most receptive to a service, allowing banks to provide unique products personalized to their needs. To build true customer-centricity in the long-term, the mindset of the modern-day bank needs to change. The CMO must act as the navigator on this journey, taking the leading role and highlighting the benefits of cognitive technologies such as AI to the Board. In five years, the traditional role of the CMO certainly might not exist in the same guise as it does today. I predict the CMO’s role changing into that of a Chief Data Officer or Chief Customer Officer – someone who dives into advanced data analytics and prioritises the needs of the customer. The customer is continuing to shape the way we interact with our banks in every way. Banks that fail to deliver true customer centricity in this fast-approaching competitive world, driven by open banking, surely won’t survive for very long. As Chief Marketing Officer, Martin is responsible for the global marketing organization at Finastra. 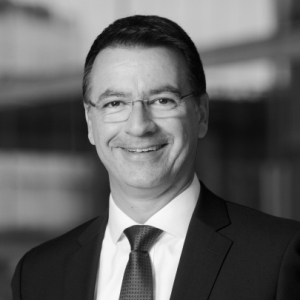 Martin joined Finastra in October 2014 and brings more than 20 years’ technology marketing and executive leadership experience with global market players to the company. Martin came to Finastra from Akamai Technologies Inc. where he was the Vice President Marketing and Channels, responsible for all marketing functions and channel sales divisions across EMEA. Prior to this he was the worldwide Marketing Vice President Oracle’s Hardware Line of Business and the EMEA Vice President Marketing and part of the EMEA Executive Board for Sun Microsystems. He was also the Head of the Supervisory Board of the Sun Germany legal entity.